One of the features on the Samsung Galaxy Note 2 that has created quite a bit of buzz is Multi Window, which adds split-screen functionality and allows you to simultaneously task through two applications. This feature can be toggled through a menu that appears on one side of the screen and only works with a few selected applications (unless you mod your Note 2). Thanks to a new hack from XDA Developers, you can now turn the Multi Window task menu transparent, so you can still see what's under it when switching applications. 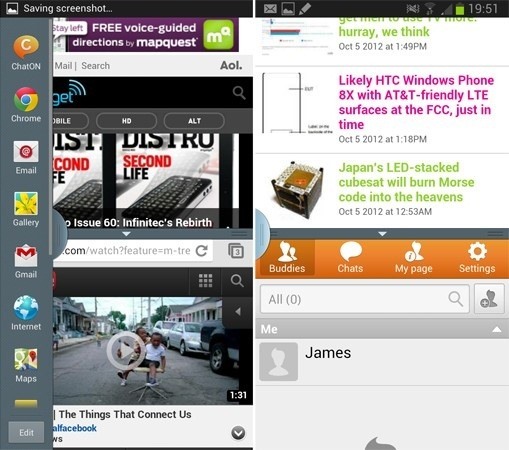 Download the files from XDA Developers user kest874. Copy file to your phone's internal storage. Boot into CWM Recovery by simultaneously holding Volume Up, Home and Power buttons. The device should boot in a few seconds. Make a Nandroid backup of existing ROM. Choose Install Zip from SDcard, Choose Zip from SDcard, scroll down and select MultiWindowTheme.zip file. Multi Window menu will be transparent and should look like the menu in the picture below. 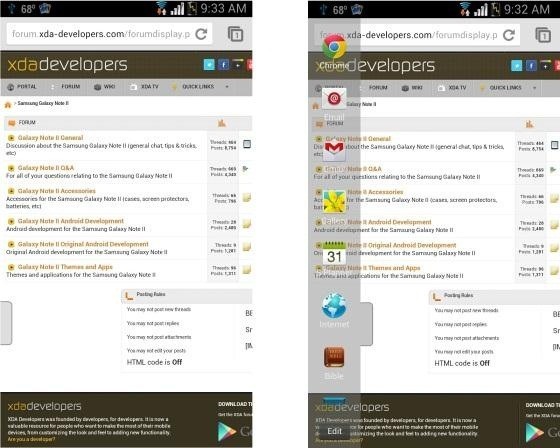 For complete instructions, check out the thread in the XDA Developers forum.